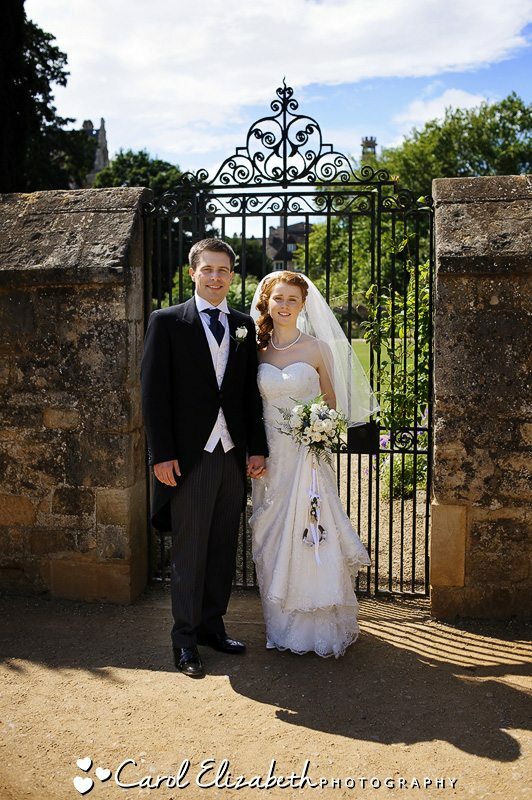 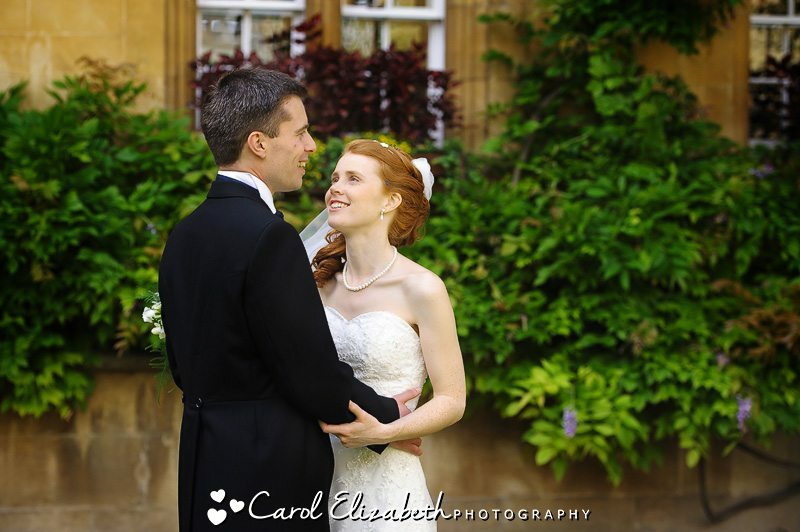 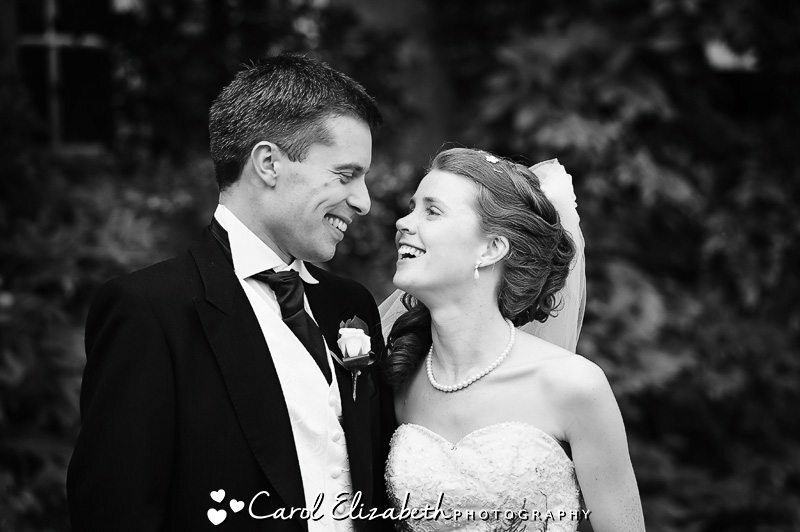 Elly and John were married in Oxford on a typical English summers day – beautiful sunshine followed by showers followed by more sunshine. 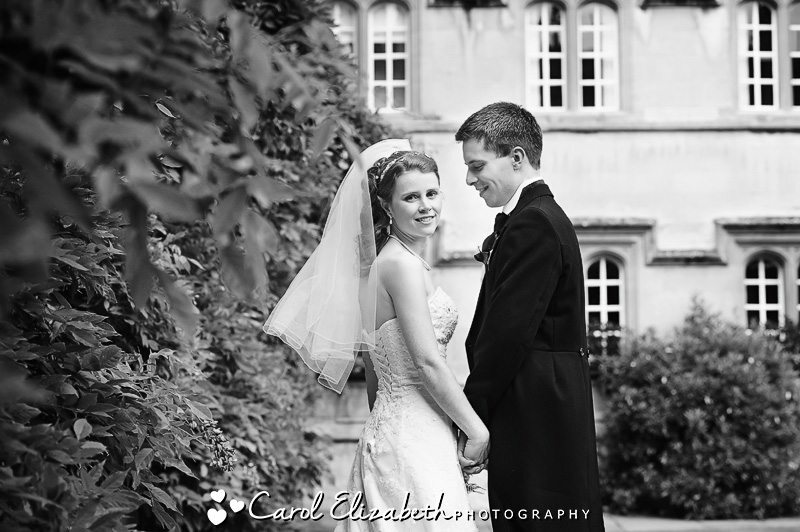 They followed this with an Oxford College wedding reception. 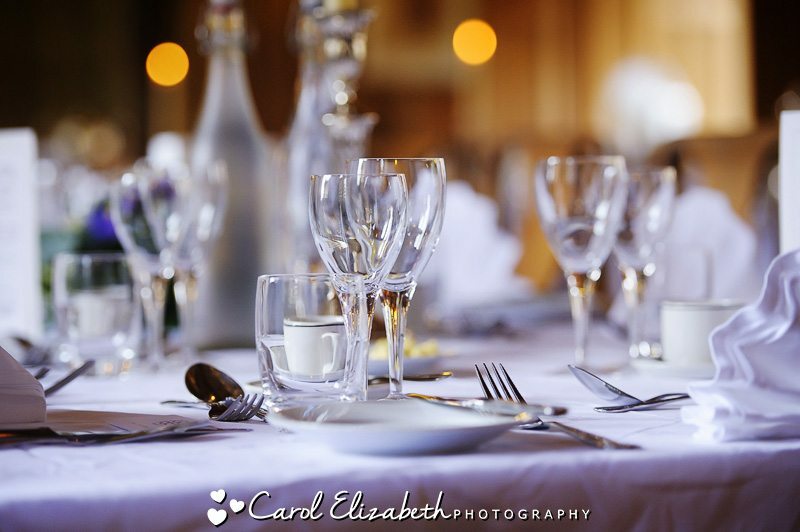 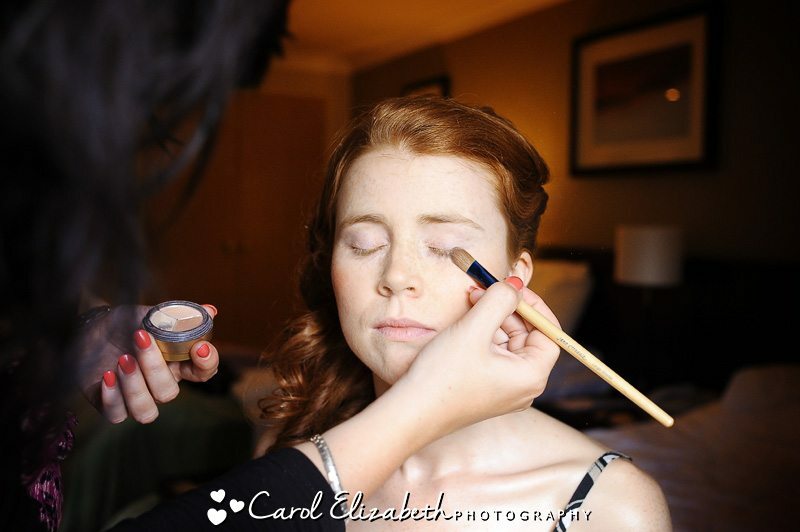 Elly and John had planned a whole day of celebrations, and I started the day with Elly at the Oxford Spires Four Pillars Hotel for her wedding preparations with her bridesmaid Cath. 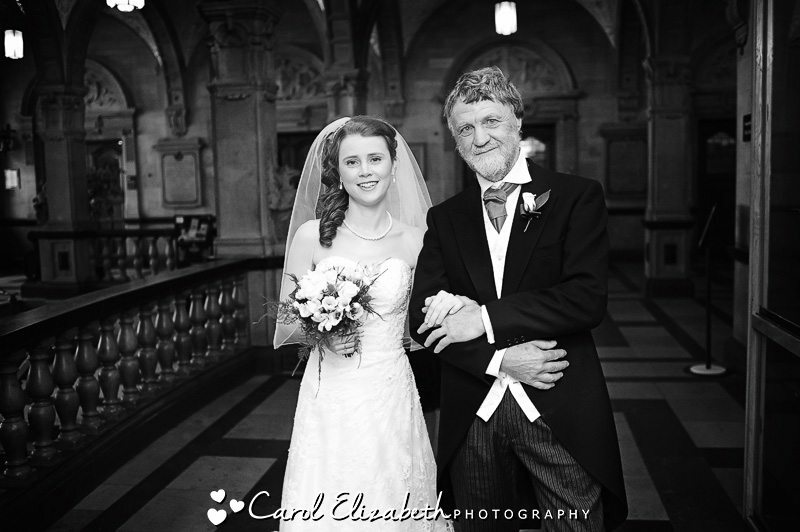 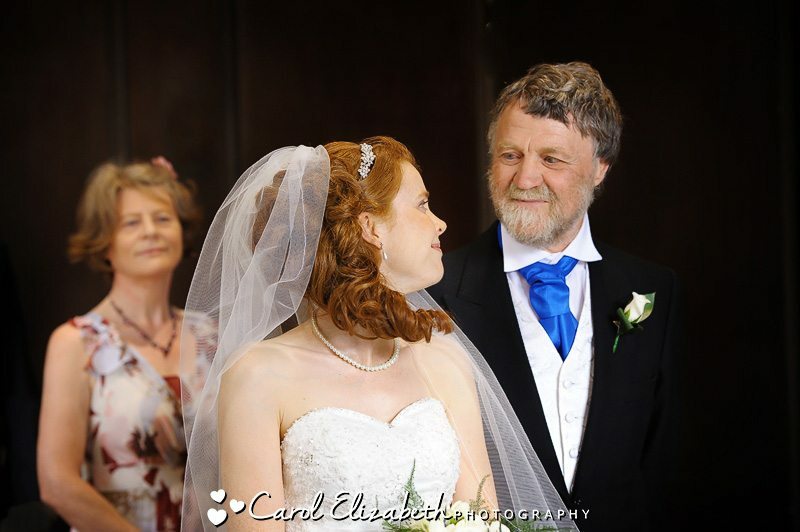 Elly was very calm when I met her, but soon became very excited when her parents arrived and she pinned on her Dad’s corsage, then started to get dressed in her beautiful wedding gown. 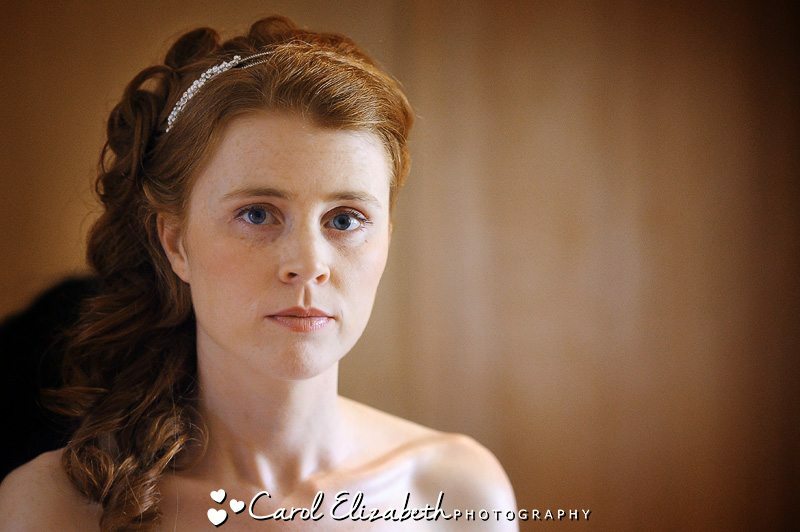 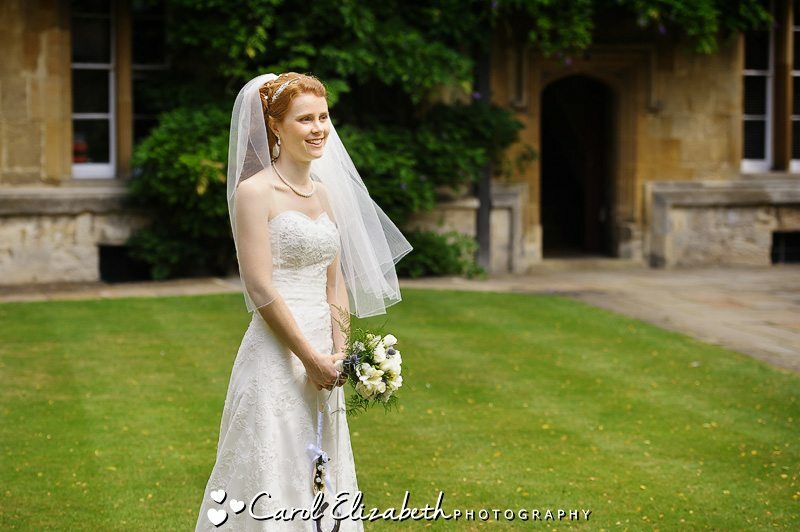 Elly is stunningly gorgeous, and her hair and make-up were perfect (I’ll add details of make-up artist as soon as I find her card!). 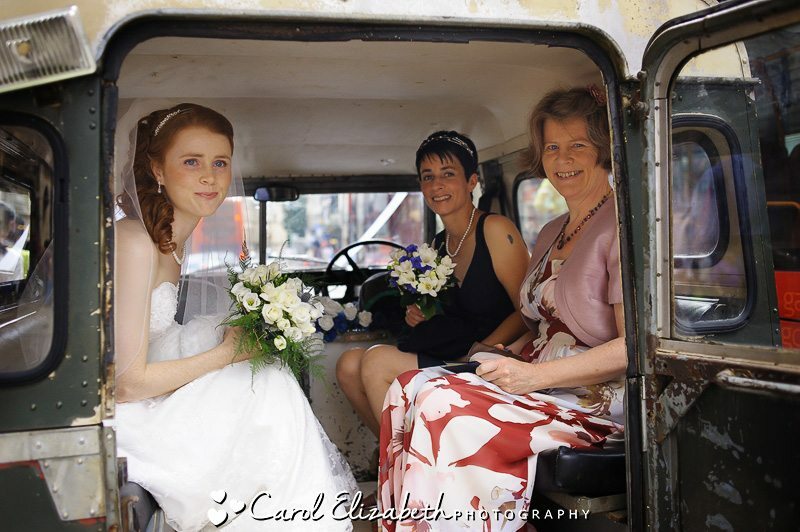 We raced off to the Town Hall, and I managed some photos of the bridal party arriving at the Oxford Town Hall in their classic old Land Rover, which looked great fun! 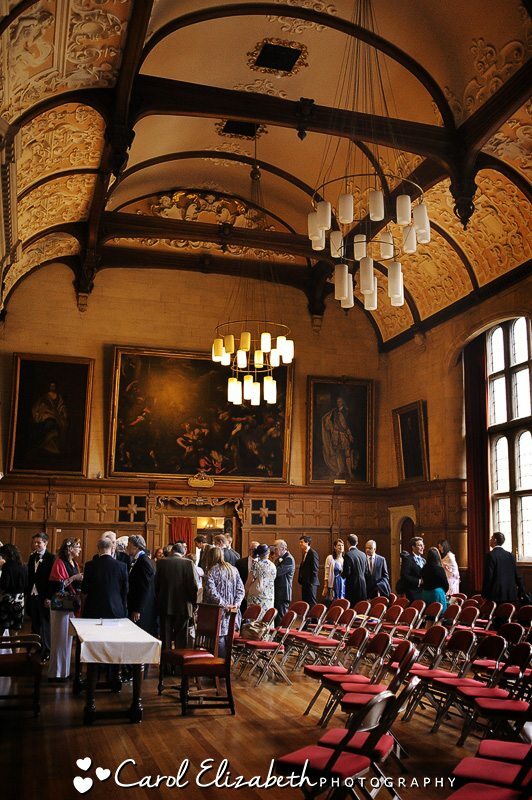 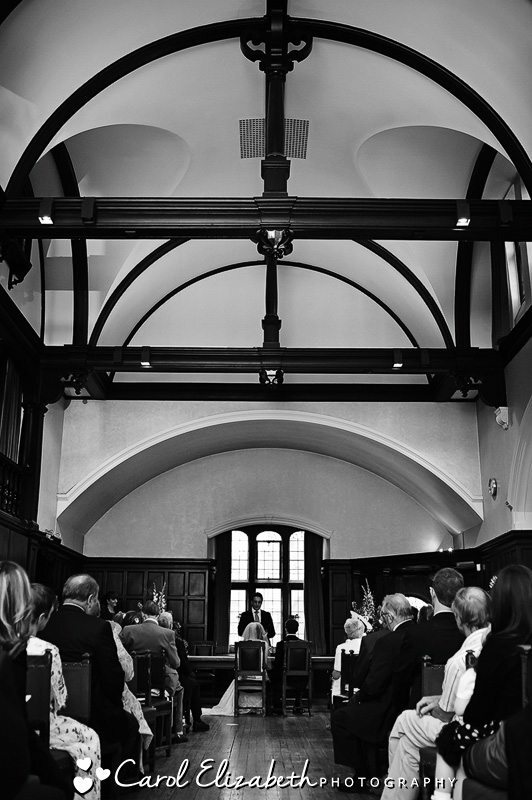 The wedding ceremony was held in the Old Library which is a lovely light room upstairs in the Town Hall, and it was very emotional with some lovely readings. 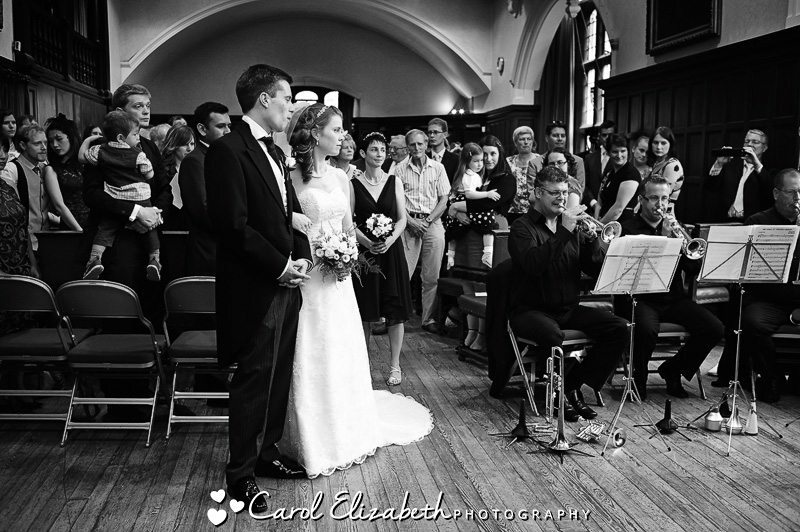 The happy couple were played out by their fantastic band and then mingled with their guests. 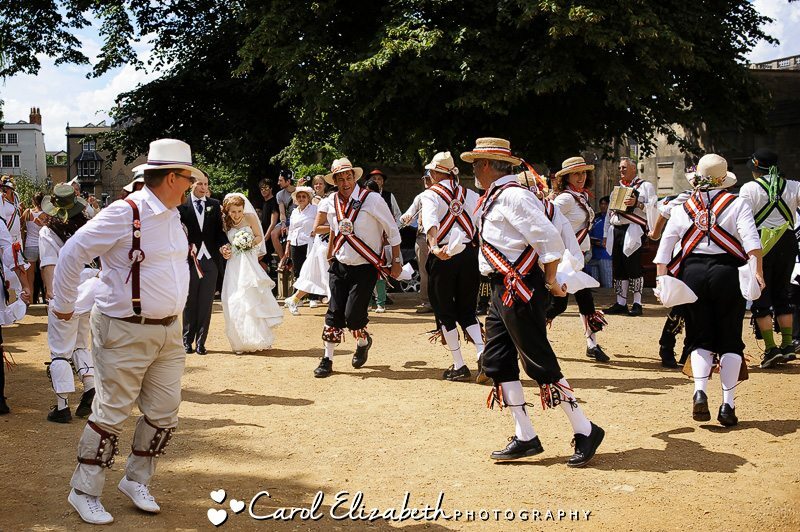 We then took a leisurely stroll through the very busy streets of Oxford and into Christ Church Meadow, where we were greeted by Morris Dancers, who escorted the bride and groom up the pathway. 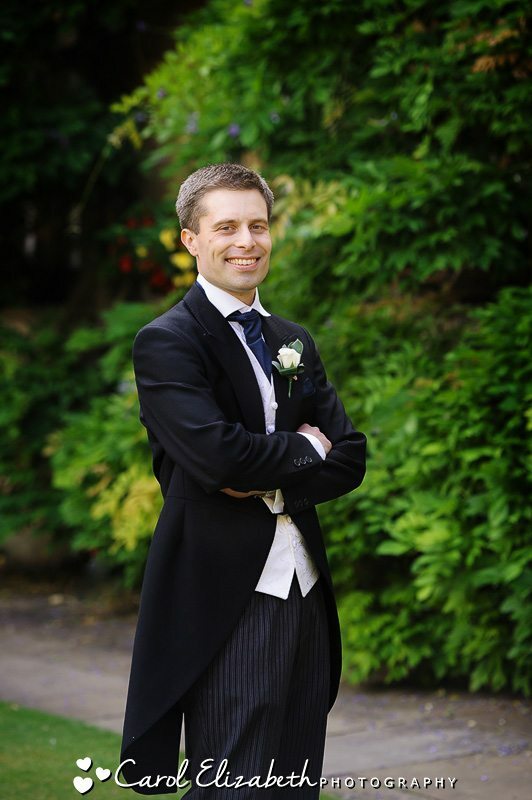 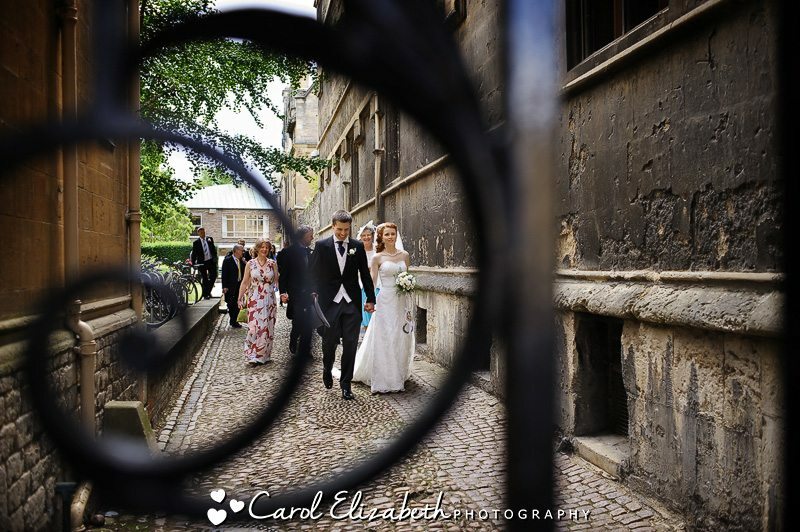 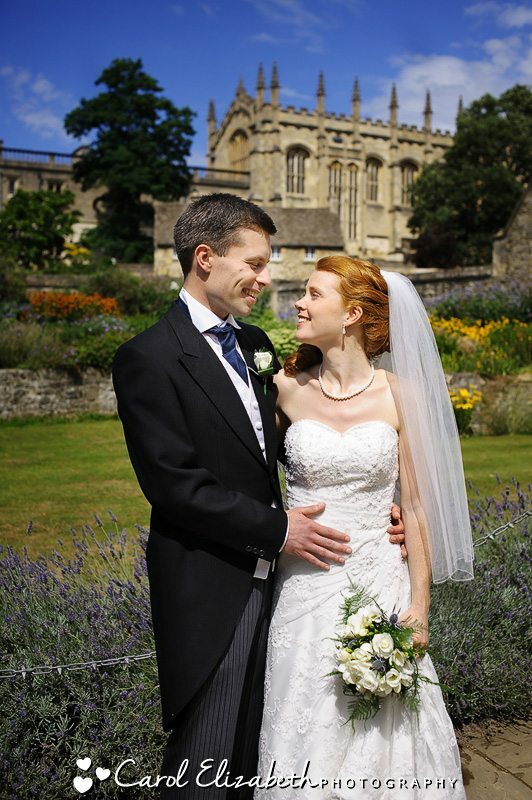 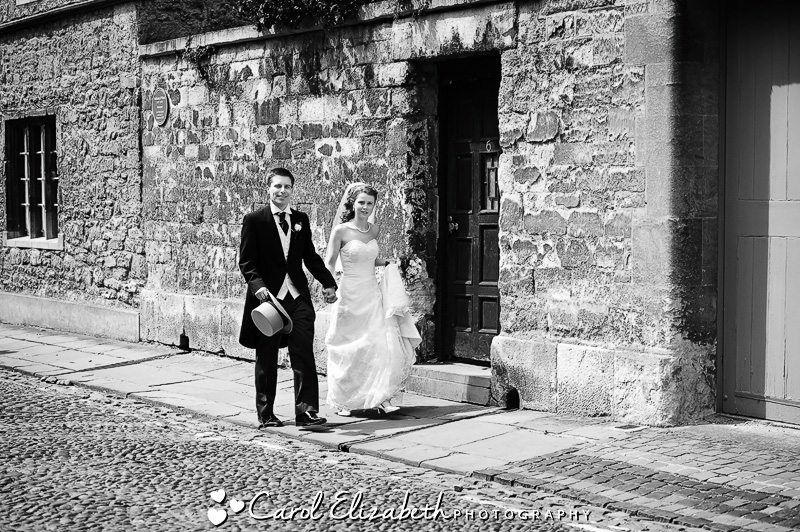 We then then carried on to the University College wedding reception – drinks reception on the lawn followed by bride and groom portraits in the grounds of this beautiful College. 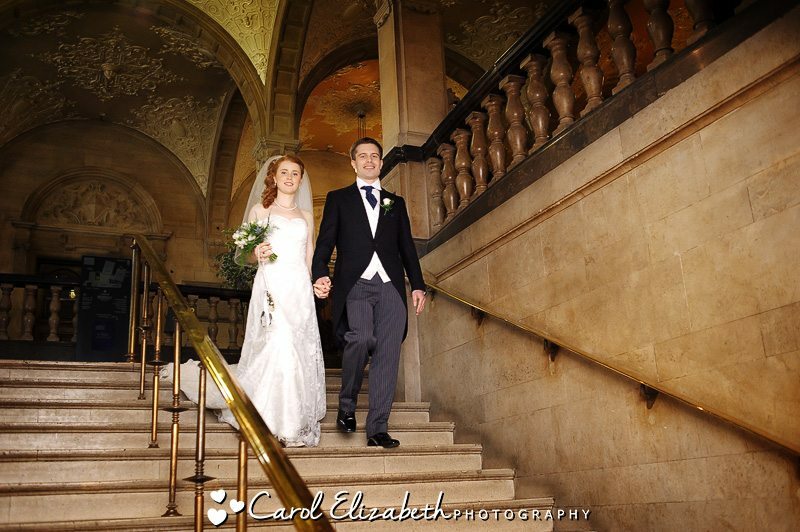 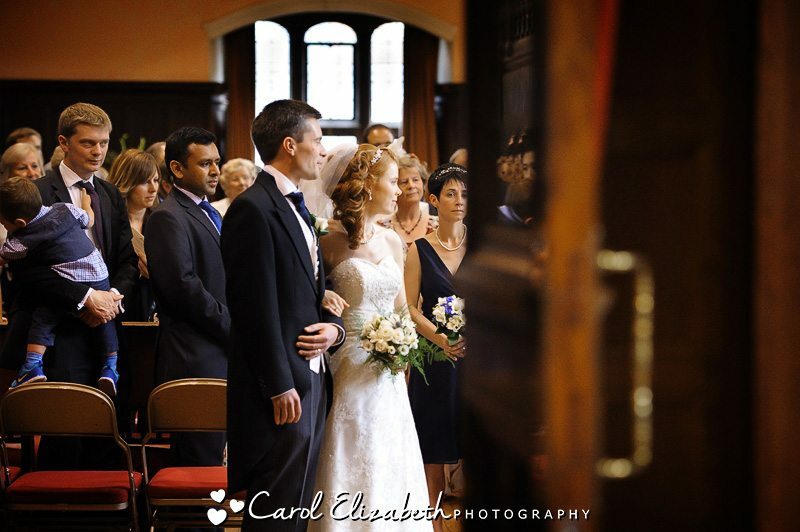 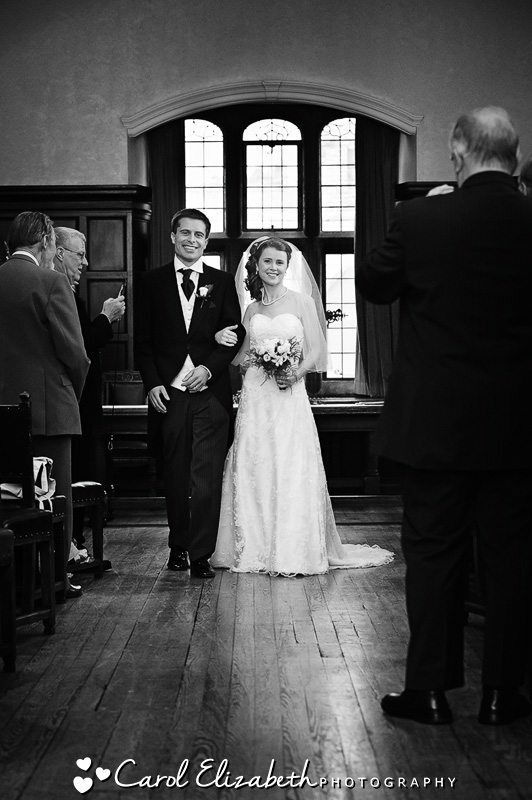 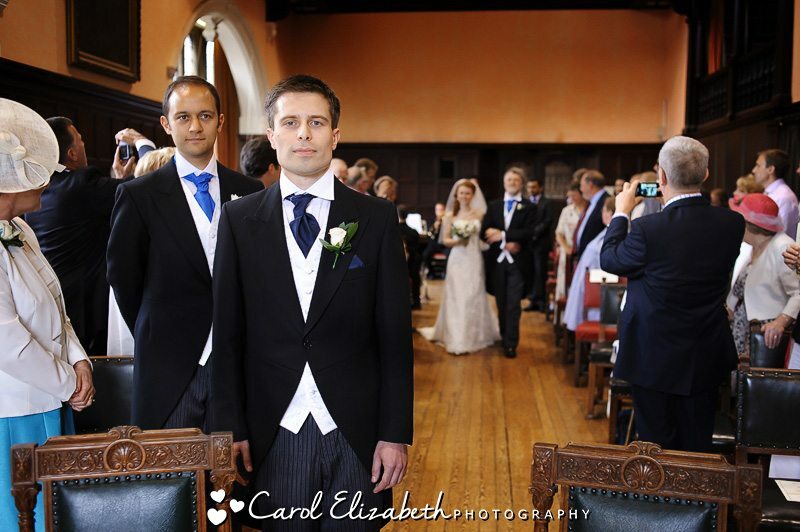 The happy couple then escorted their guests upstairs for their wedding breakfast. 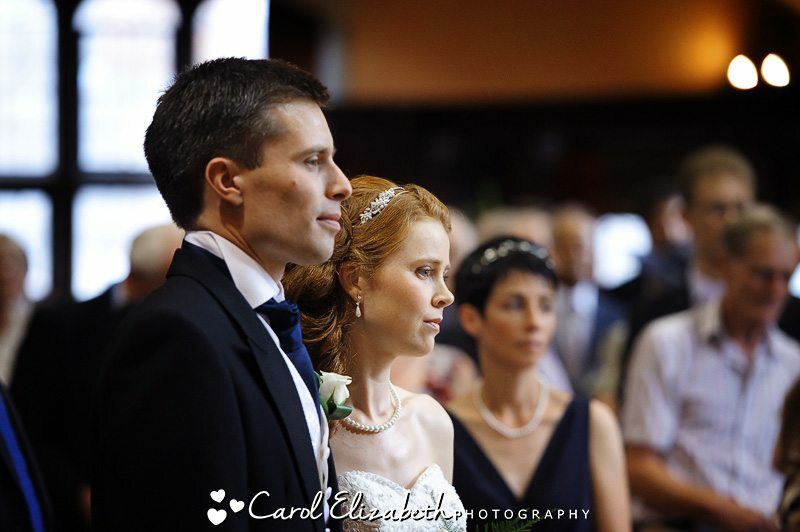 After the celebrations there were more festivities planned – a trip down the river by boat and more eating and drinking – what an amazing wedding day for this fantastic couple and their wedding guests. 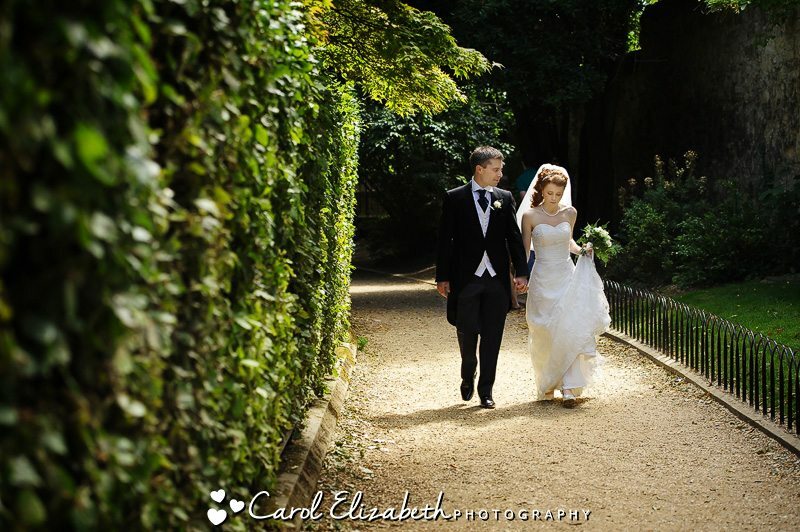 I wish you both a lifetime of happiness together as you embark on your journey as husband and wife. 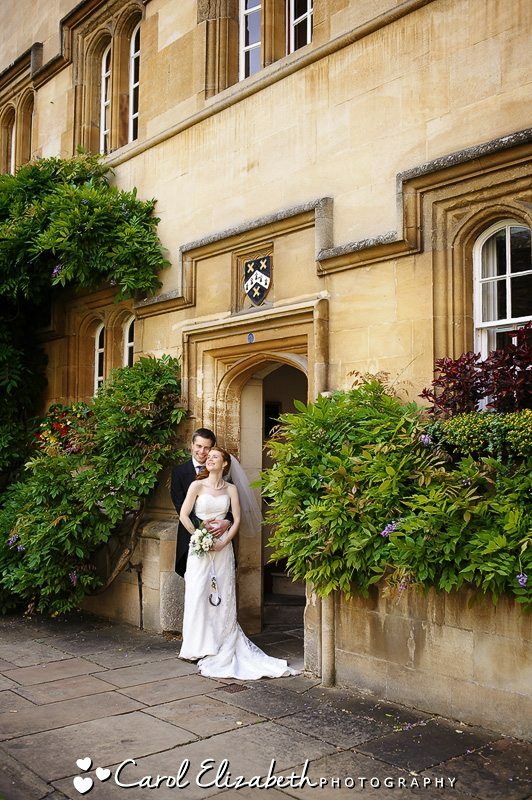 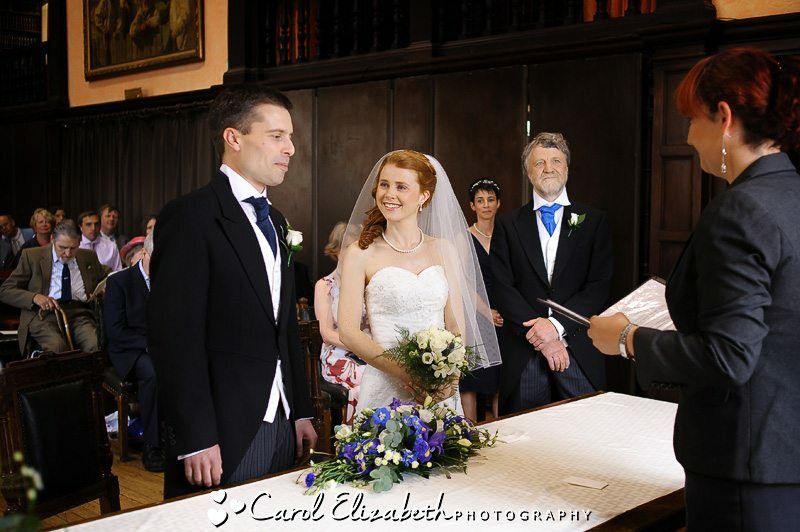 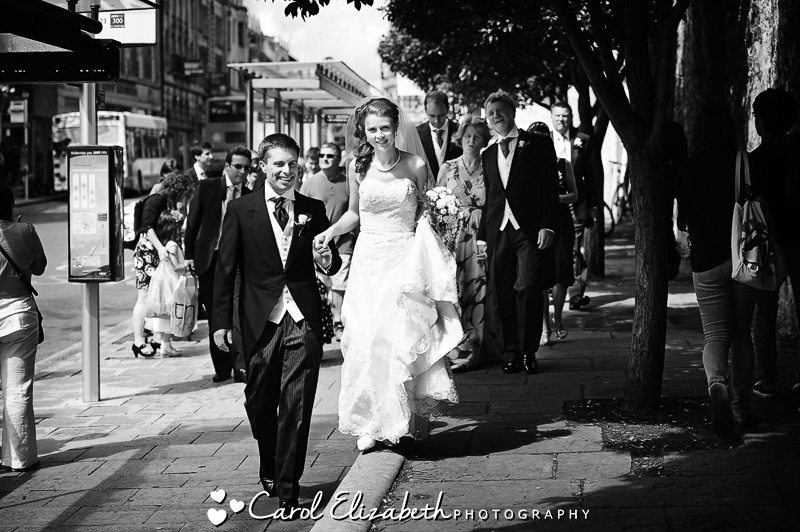 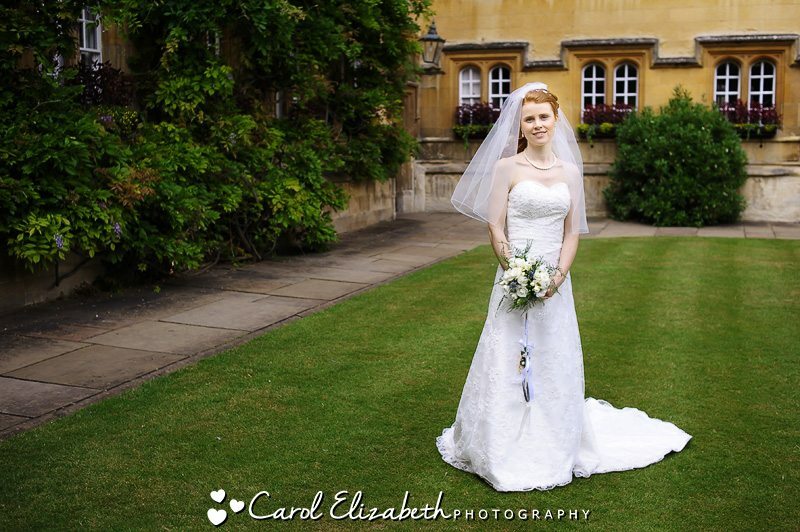 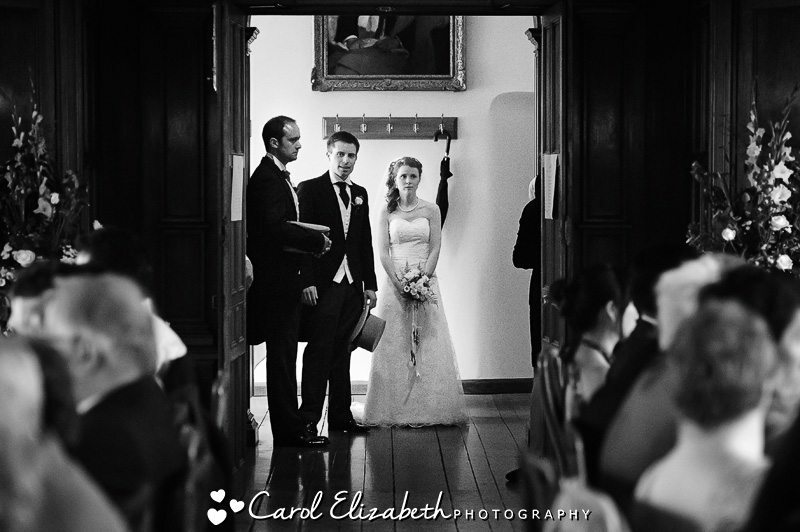 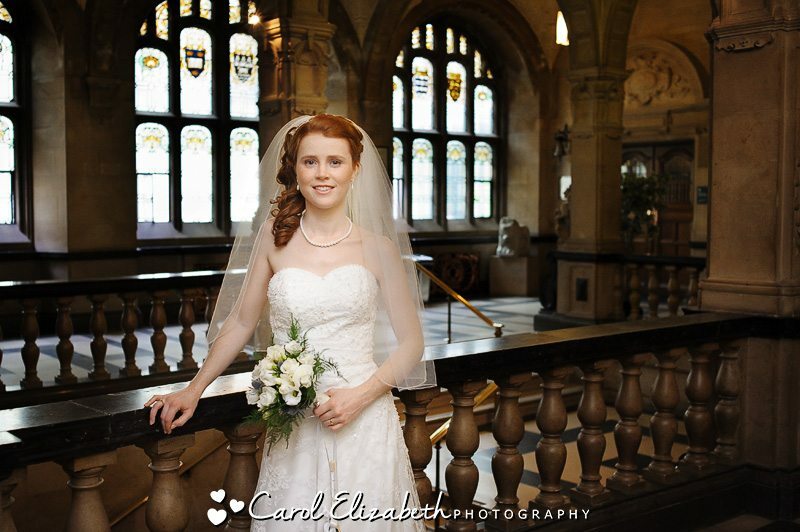 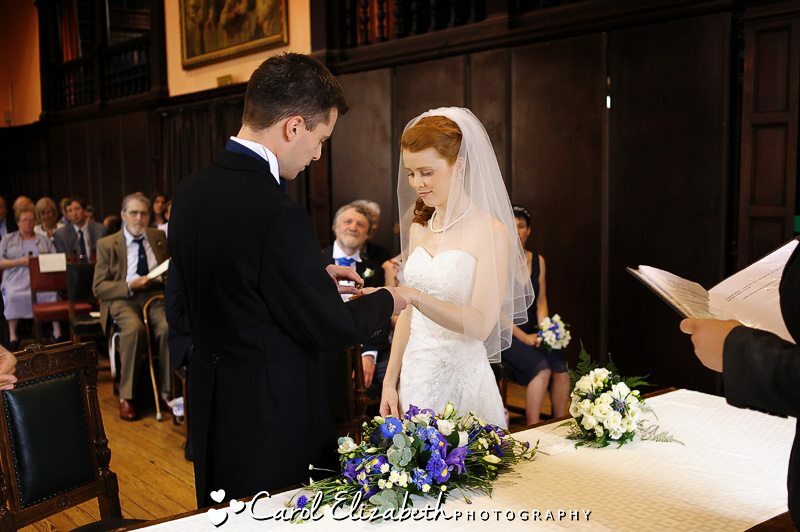 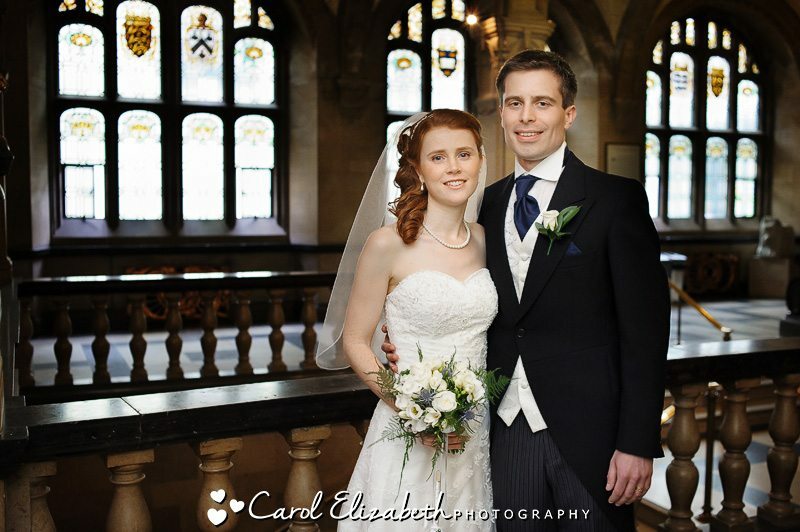 If you are looking for an Oxford Town Hall wedding photographer or if you are interested in finding out more about Oxford College weddings then please don’t hesitate to get in touch, I look forward to hearing from you!